You would think having a PGA Tour player in the field of an event (or even more so, playing with him) would make a player nervous and under-perform. But (at least in 2 golfer’s cases), it has definitely elevated their games given the circumstances. In fact 2 players lead the Abbotsford PGA Tour Player by one shot heading into tomorrow’s final round of the 2016 Johnston Meier Vancouver Open. The most surprised of his play is co-leader Kevin Stinson of Mission. In fact, just 3 days ago when the 1st round pairings came out, Stinson admitted to being rusty and underprepared for the event, and particularly with the grouping with Hadwin this week. The reason for that? 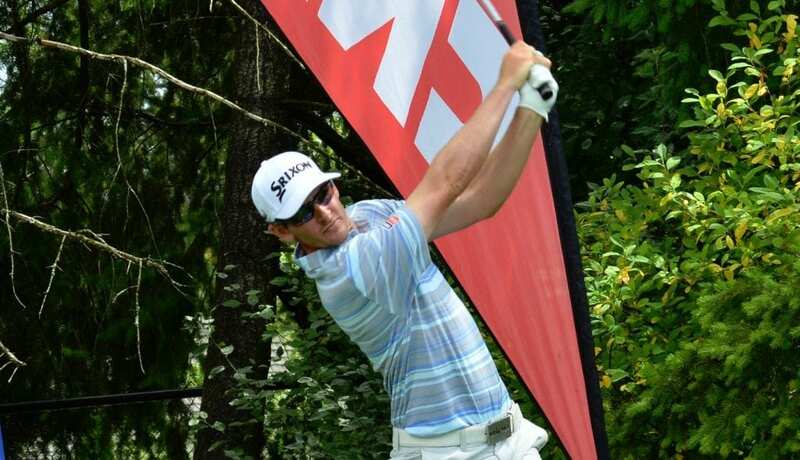 The Hazelmere Golf Course ambassador has been out Monday Qualifying for the Mackenzie Tour PGA Tour Canada, but after not gaining access to either the Kelowna or Saskatchewan events, he put his own clubs down and suited up as caddy for fellow pro and friend Ryan Williams. And he did a great job, assisting in a 2nd place finish at Kelowna and a top 25 finish at Saskatchewan. When reflecting back on why he managed to pull his game together after such a hiatus, Stinson paused and said “I think being away from the week-to-week grind as a player (and instead as a caddy) gave me a different outlook, and I was really refreshed each day. So maybe that’s what I needed and I’m re-charged now that I’m back to my own game”. “The pairing with Hads and Wheels was pretty comfortable for me playing with my past roomie in Phoenix and having played with Riley so often since Junior days”. Asked about the remainder of his season, Stinson hesitated and said honestly it was still a bit up in the air. “I definitely still want to be pursuing my game and aspirations on tour, but we’ll see how RDUB (Ryan Williams) goes the next couple of weeks. If he gets into the RBC (Canadian Open), I will definitely fly back east and loop for him in that event and see from there”. He shrugged modestly (as he is) and stated “Yeah, that wouldn’t be all that bad” when asked if heading back east with a Vancouver Open Title under his belt would feel pretty sweet. 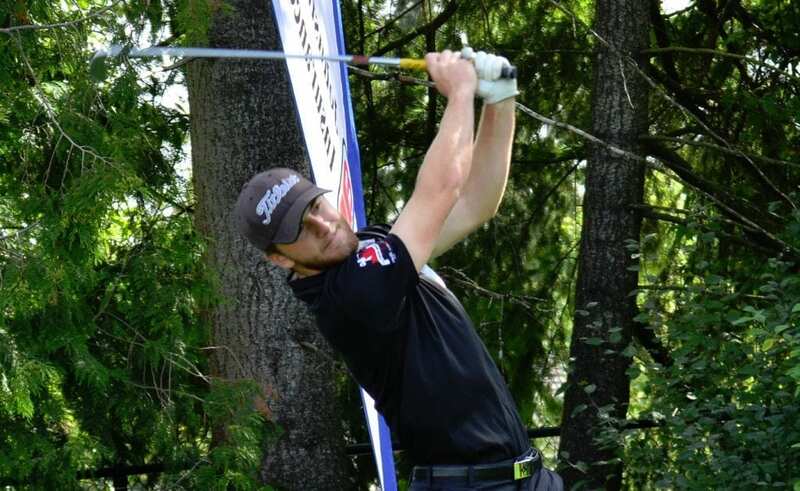 The first player to post at 139 (-3) was 22 year old UFV Cascade Player Connor O’Dell, who fired rounds of 68,71 that included a total of 8 birdies and an eagle. In a post round interview O’Dell declared “I honestly don’t know what’s got me playing so well this week. Everything just seems to be falling into place and clicking. I guess I’m just doing everything well and not making any big mistakes”. Answering if local knowledge from past VGT events at Pagoda Ridge is helping him out, O’Dell commented “For sure, having played a number of events here helps me chart way around the course knowing my lines and where to avoid on certain holes”. There is definitely some local knowledge on Pagoda Ridge so it’s definitely to my advantage over those who may only have played it once or twice”. O’Dell was quick to add that all the tournament play he has been privy to thanks to the UFV Golf Team and it’s well organized program (thanks to coach Chris Bertram) and has been a huge part of his development process. One of those players O’Dell may (or may not) have been referring to was his playing partner Kevin Vigna of Vancouver Golf Club, who was 1 shot clear of O’Dell through the front nine today before 2 blow-up holes de-railed him on 11 (double) and 14 (triple). Vigna sits at +1 and just 4 shots off the lead. Another player who had very little experience with Pagoda Ridge before this event was PGA Tour player Adam Hadwin of Abbotsford. So little in fact that he had never played the 7,000 yard Championship layout. At least on the front 9, Hadwin found a few places on the course that were not ideal, but he managed to grind his way around the course and make the most of a round that could have got away from him. A chip-in on 5 and up-and down from 100 yards on the 6th certainly got his day kick-started. But a sloppy wedge on the short 8th par 3 led to an untimely bogey. However, in true PGA Tour fashion, Hadwin took advantage of a break on the 9th when his drive ricocheted back into play. He wedged it to 8 feet and drained his putt for birdie. His back 9 was a bit less fruitful, carding a lonesome bogey on the 14th hole, to card a 71 (-1) and two day total of 140 (-2). He’ll start the day 1 shot back of co-leaders Stinson and O’Dell and knowing Hadwin, will be doing everything in his powers to secure the trophy over both his peers and admirers chasing him down. Hadwin will be paired with his old roommate Stinson and Chilliwack Amateur O’Dell in the final pairing of 3rd and final round action of the Vancouver Open. They tee-off at 12:12pm at Pagoda Ridge with a total of 12 golfers in hot pursuit including 12 players within 5 shots of the lead. Weather is supposed to be ideal for the 3rd straight day, and with Pagoda Ridge’s greens in absolutely perfect shape, there is no reason for someone to post a low one on Sunday. The only question is, will it be from the final group or someone chasing? A total of 22 Professionals made the cut (150) to play the final round tomorrow. Round 1 leader Jordan Lu (Vancouver, BC) struggled to close out his day on round 2 with a double and 2 bogeys on his last 5 holes to card a score of 76 (+4). He sits in solo 4th place overall, and in solo 2nd in the Overall Amateur Competition, only 2 shots back of O’Dell. He is paired with Amateurs Connor McClellan (142) and Dean Reddicopp (142) and will tee-off at 12:03pm. And don’t count out Bear Mountain’s Riley Wheeldon, who made a great rally on his day after an opening nine of 38 (+3) to shoot 71 (-1) and head into the final round just 3 back of O’Dell and Stinson. He’ll be paired with Sandpiper’s Garrett Kucher (71,71) and Langley Golf Center’s James Allenby (70, 73). Tickets for final round action are available online at www.vancouveropen.ca or can be purchased at the gate. Daily admission is $10/person and free for juniors 18 and under with proceeds going to the First Tee of Greater Vancouver YMCA.